I watched my son go through Boy Scouts, where he learned skills that I doubt I could have ever taught him – life-saving techniques, building projects, even archery and marksmanship. He also made some friends for life, both young guys and adult men who live their lives with intent and integrity; and I’m forever grateful to the Scouts for helping my son and many others grow from boys into men. For one troop member’s Eagle Court of Honor years ago I drew a quick cartoony Eagle saluting, wrote ‘Congratulations, Kyle!’ below it and taped it to a little gift. A lot of people commented on the cartoon, so I tightened up the drawing and made it into a lighthearted card, printed it up with my own sentiments inside, and it’s been a regular seller since then. When my son made Eagle a year or two later I decided to draw another, and this time went for a more heartfelt image, a Scout planting an American flag on a hilltop, with an Eagle circling nearby. This one has proven even more popular, and I’m happy to have two cards with two different feelings for people to choose from for their congrats to their favorite Scout. 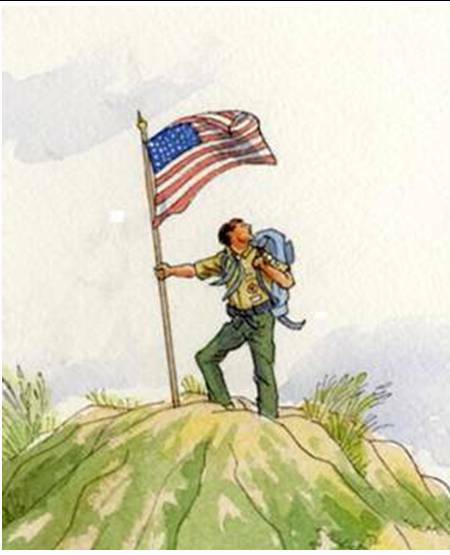 My cards and posters of these images are available here on this site – just go to https://achillesportfolio.wordpress.com/eagle-scout-congratulations/ to see them and purchase easily online. I’m planning to create a similar card for the Girl Scouts’ Gold Award, because those young women deserve a big congratulations as well!